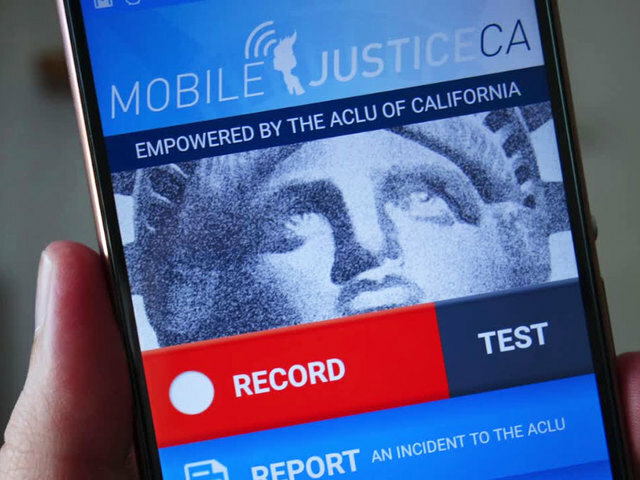 According to bgr.com, the new app is called Mobile Justice California, and it has been officially developed and endorsed by the American Civil Liberties Union. While using the app's "Record" feature, after recording video of police engaging in any form of inappropriate skullduggery, the clips are sent directly to the ACLU. If you need to be discreet about your divulging, reports sans video can easily be made via text in the "Report" feature. But the overall idea reaches much further than that. A checklist of information regarding the time, location, and other details of the incident is provided in the app. Actions of both parties (the cop and the civilian) are documented, so if your situation seems extremely dire, steps can be taken to get you help as soon as possible. "Well, the video looks kind of cool, but I think we're in trouble here...please send help?" All submissions are anonymous by default, but have the option to include name, phone number, and email if you want the ACLU to follow up on your case directly. Another interesting feature is a "Witness" function that indicates if others in your party / riot / peaceful pepper-spray-in are recording nearby, so that you may aid them in documenting atrocities. This could possibly be of tremendous use if the actions involved later go to trial and numerous witnesses are needed. And it wouldn't do justice to the ACLU if the app didn't come with an onboard library of "Know Your Rights"-type material regarding official protocol for what you're allowed to do on marches, in schools, in public buildings, etc. Educate better, smash the state better. Like the Clash said, "know your rights." Mobile Justice California is available for iOS and Android, and will hopefully soon entail users from many other states (Missouri and Oregon also have similar Mobile Justice apps.) Hold your public servants accountable...American police have killed more people in March of this year than the U.K. police killed all of last century. Make them know that cameras can shoot back with just as damning results. Get this blog with apps that can help you to keep your security.